Of good moments of sharing with beautiful personalities. A choice of tracks Blues sometimes mélencoliques, and sometimes energetic but quite realized with the heart. Without all these musicians, I could not express my music. They are the mainspring, my inspiration, and thanks them sincerely ! I take advantage to pay a warm tribute to Wikiloops without whom I would never have been able to discover and to share with so much pleasure. Brother, you know how I admire your joy, soulful harp playin, technically you are the expert, but most of all you always play it with a great feeling and heart!, so glad and an honor to be part of this album! A wonderful album by titi and comrades. Titi is truly a master of his instrument. Often I find myself anxiously awaiting the opening notes of his solo play on the track he has chosen to play on. Titi has his own style and sound, whether solo or accompanied, he is an asset to any song. Titi is a guarantee of versatility, brilliance and empathy. Thanks for this great album Titi! Titi knows how to use space, melody and mostly feel, he plays the blues with massive of soul. A true master of his art. Titi seems to have chosen songs with a slight melancholic feel for this collection. Get senses of feelings of longing for something that got lost along the way, and infuses their expression with a playful but soulful harp. In this, though, Titi doesn't stray too far from blues and guitar based tracks, which makes sense - doing so really lets the harp shine through. And the playing is so clean and clear, perfect tone and pitch all the way through and (outside some occasional hiss) very professional sound in the recording. I might critique some of the mixdowns here as I would prefer the harp to be more central in the mix rather than getting panned too far right for some of the songs. The harp is the centre of attention. Very creative in the melodies. Nice and varied collection - some make you chill back and drift away, others get the toes tapping. Look out for the uber soulful "Huguette", my second favourite on this album after "Do You Know", and the train shuffle country of "Pony Express" and "Leather and Powder". 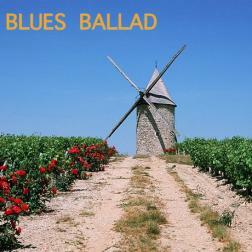 Blues Ballad- c'est tres bon!